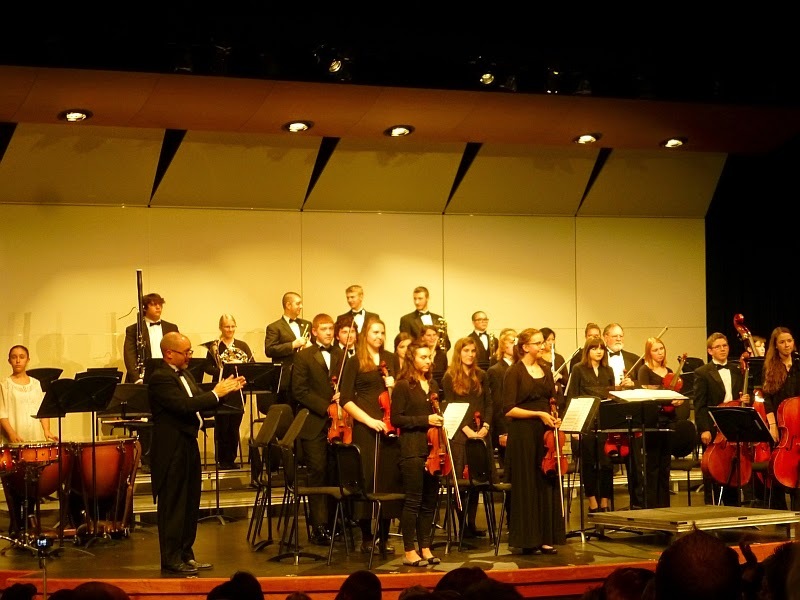 The Monday before Thanksgiving, Younger Daughter had her first performance with the Coeur d'Alene Youth Orchestra. The performance was held in the Kroc Center, part of a much larger facility. They already had it beautifully decorated for Christmas. Before the Youth Orchestra played, the Junior Orchestra had its performance. Some of these kids were so young their feet didn't even hit the floor. Yet overall the sound was quite decent and promising. The Youth Orchestra has kids between the ages of 14 and 18. Although it's not always easy to eke certain standards of dress from a group of teens, participants in the orchestra have a strict dress code: below-the-knee black dresses (or blouse/skirt combos) for the girls, tuxes for the boys. No low necklines, no sparkly jewelry that would detract from the performance. The orchestra is modeled after professional orchestras complete with a Concertmaster. Younger Daughter was diligent about practicing and attending rehearsals, and did beautifully. Because the orchestra was heavy on strings and light on brass, woodwind, and percussion, the conductor added two older, experienced musicians to bolster these areas. As Younger Daughter put it, it was either that or the foundation would fall apart. Before each piece, the conductor explained a bit about the musical selection. He chose some very ambitious pieces, such as Jupiter from The Planets (by Holst), portions of The Unfinished Symphony by Schubert, and "Into the Storm," a modern classical piece by Robert Smith commemorating the brutal 1993 snowstorm that devastated the East Coast. This was Younger Daughter's favorite piece, and she said it was the one that made her feel like she was part of something magnificent when the orchestra was playing it. Despite the concert going so well, Younger Daughter was relieved when it was over. But they played beautifully and we were glad to attend... although during the performance we all heard the enormous crash of torrential rain on the hall's roof. Driving home was a nightmare through enormous puddles of standing water and slush on the highway, as well as a nasty mixture of snow and rain. We were relieved when that drive was over! Yeah, what a shame those home schooled kids get no socialization. Ha! Delightful! She's a charming and beautiful young lady, AND is musically talented. How blessed you are! The young people in music programs are not the ones who make us worry -- ever notice? Wonderful!! How proud you must be. I remember the family that gave her the violin when they moved away. Some plant the seeds and others harvest the fruits.